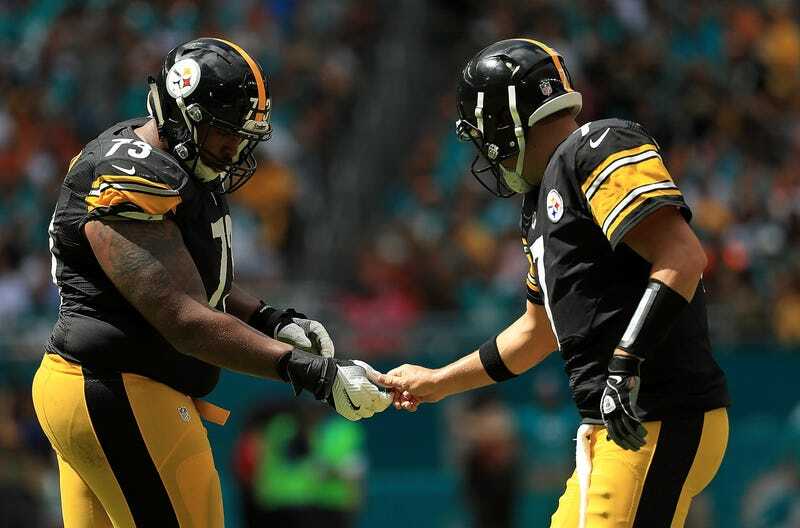 It works in Ramon Foster’s favor that most offensive linemen aren’t well known and rarely grab attention, so when he issues a call for civility to former Steelers players like he did today, it’s seen as a sign of leadership and not a desperate measure by the worst union rep in the NFL. A few days after former Steelers receiver Antonio Brown took his latest shot at current Steelers receiver JuJu Smith-Schuster—and this came a couple of weeks after Brown said the team’s quarterback Ben Roethlisberger had an “owner mentality”—ex-Steelers running back Rashard Mendenhall weighed in on the dynamic between the WR and QB. Then he said Big Ben was racist. A few hours later, Mendenhall walked it back as some kind of thought experiment on how black athletes are perceived. Bad thought experiment! This was likely what prompted Foster to issue a statement (using the Notes app) declaring that any “former player or affiliate of the Steelers” could come to him or teammate Maurkice Pouncey if they wanted to settle their issues with people within the locker room who have made them mad. Roethlisberger is so lucky to have two personal flacks working for him. Now that former players are speaking up about the Steelers’ moody degenerate of a quarterback, though, it’s better to keep that stuff in-house, even if the team no longer employs or pays those guys. No player should trust Ramon Foster.